March 25, 2015: Rate Expectations? February marked the first anniversary of the Warehouse 23 changeover. (Why didn't we have anniversary cake?!) The site continues to be tweaked and improved behind the scenes, but lots of good bits have been here since the beginning. For example, ratings. Did you know that you can rate anything you've bought via Warehouse 23? It's useful to us and to other buyers, letting them know what's hot or cool, and what wasn't your favorite. Rating stuff is easy! 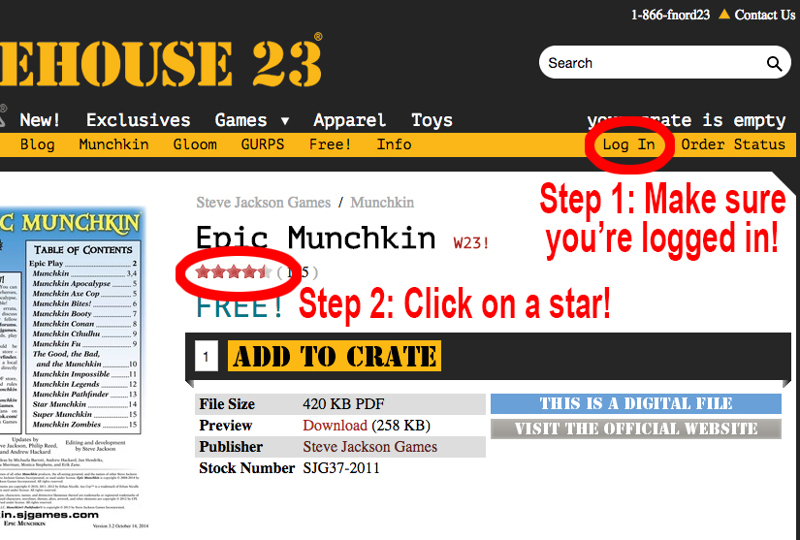 Just make sure you're logged into your account (via the handy "Log In" link on the orange bar at the top), re-visit the page of an item you purchased, and click the star rating you'd like to give it. It's a five-star rating with possible half-stars, so ratings range from 0.5 through 5.0. And if you want to make it easier to revisit those pages, just go to your orders page, which lists all previous orders. Click a past order, click the name of item(s) from that order, and rate away!